As an adult I’ve often interpreted Christ’s instruction to become like a child as a call to meekness, humility, submissiveness. But the childhood world where I see my own children thrive is colorful, textured, a little unruly, unpredictable. it is not made of humility alone, or rather, it is made of the kind of humility required of true experimentation. My children have taught me to play again…They play by moving their thoughts around, rearranging the world one hundred times a day; they play by asking questions without guilt or embarrassment. They are unreasonable in their taking but also flawless in their giving. In a child’s world, a paper heart actually does fix sadness, and when I am like a child, wiling to extend grace to that offering, my sadness is lifted. Play for my children consists of hours submerged in countless possibilities. Could we not do the same with our own spiritual lives? My children argue without guile and defend without one hundred percent certainty that they are right, just to see what defending the idea feels like. Could we not do the same with our faith? While Watterson touched on childhood and life experience more generally, cartoonist Scott Hales delves into the details and nuances of Mormonism’s unique and somewhat odd culture while capturing the same kind of magic described above. 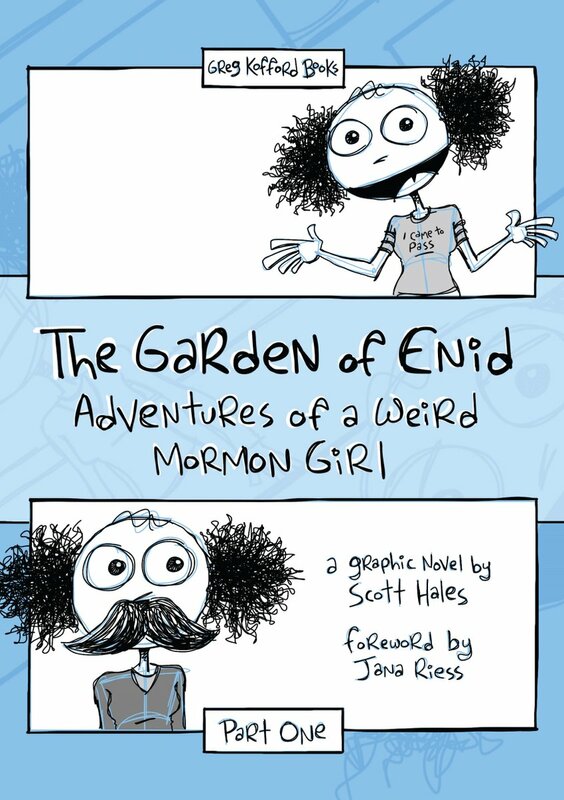 His new graphic novel–The Garden of Enid: Adventures of a Weird Girl, Part One–follows the thoughts and experiences of Enid: a witty, contemplative, socially-awkward (“weird”) 15-year-old Mormon girl. 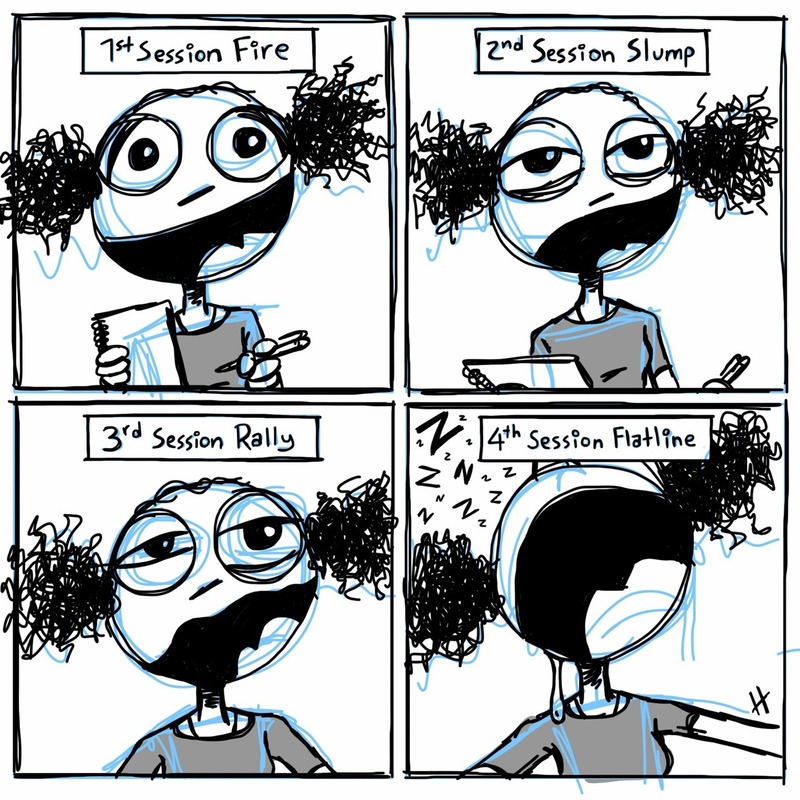 The hilarity of the strips stems from the portrayals of embarrassingly familiar situations faced by young Mormons: stake dances, boring teachers, YW camp, EFY, etc. Reading them feels like being in on an inside joke. Their depth, however, emerges from the moments of loneliness, uncertainty, reflection, and flickers of human connection. 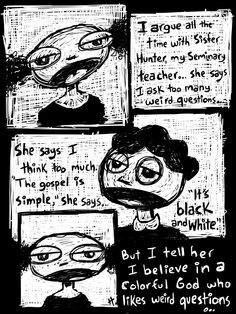 For me, the heart of the graphic novel is summed up in Enid’s exchange with her McConkie-loving seminary teacher who dismisses her “weird questions” in favor of a supposedly “simple”, “black and white” gospel. By contrast, the God Enid believes in is a “colorful” one “who likes weird questions.” Similarly, life is not “black and white.” It’s not even gray. It’s vibrant. Enid’s daily ponderings take her from the edges of space and time as she imagines what it’s like to be an unorganized intelligence (Enid vs. Deep Doctrine) to the irritation of dress standards and freezing AC temperatures at stake dances (Enid vs. The Modesty Police). Eternity’s collision with the mundaneness of everyday life peppers Enid’s adventures as does the ofttimes apparent contrast between the richness of the gospel and the banality of the institution (similar to contrast between imagination and reality in C&H). Enid’s wit is put on full display with the random T-shirts she sports in a number of strips: I Can’t I’m Mormon, Flunking Sainthood, I ♥ Dieter, Free Mahana, Team Emma, and so on. Enid touches on various topics, from Mormon kitsch (Enid vs. The Origin of Mormon Kitsch) to McConkie’s Mormon Doctrine (Enid vs. The Book) to the homogeneity of the Bloggernacle (Enid vs. The Echo Chamber) to the struggle to stay awake during General Conference. Where Enid the shines the most, however, is when she touches on the harder parts of lived religion and, frankly, living in general. She communicates the deep pain that comes from not having the “ideal” family in a church that makes family central to its theology. We can feel the longing for connection when she talks about how she knows little of her sick, single mother’s past, explaining it with, “We’re not that close” (Enid vs. The Backstory). The ache of abandonment and loss is felt as she relays the story of how she broke down in primary one Sunday during the first line of “Daddy’s Homecoming” when it hit her that daddy was never coming home (Enid vs. The Primary Song). We are subtly reminded that no family is truly ideal and that we all have our own familial issues and dynamics. Then there is Enid’s social awkwardness and introversion that make the idea of eternal social gatherings a little anxiety-inducing for her (Enid vs. Eternity). Eternal marriage sounds awfully daunting for a “girl who’s never had a conversation with a guy for longer than 30 seconds” (Enid vs. The Sacrament Meeting Talk). This fear is made all the more acute when those social gatherings appear to be exclusive (Enid vs. The Invitation). And of course, there is the struggle “to know what’s true and what’s not true and what’s only kinda true.” We’ve all been there. For me personally, it was the concluding strips depicting Enid’s EFY experience that brought all of this to a satisfying conclusion. For the first time, Enid feels like she actually has friends. For the first time, she thinks a boy might really be into her. And for likely the hundredth time, she feels rejected. And yet, she finds a little comfort in a brief, intimate moment with someone she did not expect. I went to EFY each year with varying degrees of positivity. It was my last year, however, that was the most important. Unlike Enid (who sees her testimony as being just fine), my own struggles with belief were quite prominent the summer between my Junior and Senior years of high school. For starters, I was a 17-year-old boy. Furthermore, I was in deep trouble with my parents at the time for end-of-the-school-year shenanigans (*cough*, alcohol, *cough*). Finally, I felt absolutely nothing at church. I remember sitting there during one of our group’s testimony meetings toward the end of the week and being the only one who didn’t get up. I scribbled angry, frustrated thoughts down in a notebook trying to cope with the conflicting feelings I was having. And during the midst of all this teenage angst, lo and behold, who does God send? A girl. Because of course He did. And just like Enid’s week-long crush, this one did not return my affection. Case in point: when I called her after EFY was over, the first thing she asked was, “How did you get my number?” She apparently blocked from her memory that she had given it to me during one of the dances. Go figure. Despite the rejection (which I was in denial about for a month or so), she was also inspiring: she had a solid idea of who she was, what she wanted to be, and how to get there. And all this seemed to flow from her testimony. All I knew was (1) I wanted to be like that and (2) I wasn’t. That was the moment that led me to get my act together, go on a mission, and become the world-famous Mormon book reviewer I am today. What Enid’s EFY experience as well as my own teaches me is that the superficial nonsense–the cheers, the speakers, the variety shows, the programs–don’t mean much. It’s the small moments when you truly connect with someone; when you allow yourself to be touched by somebody else. And we forget that at our own peril. The Garden of Enid is what it is to be an American Mormon in microcosm. Even though the main character is a Mia Maid, Enid’s experiences can resonate with Mormons of all ages and genders. For me, Enid is that ward member that you have an unexpected, but incredibly moving moment with; that member who totally “gets it” when you’re unable to put on a smile at church. But she also–like Calvin–can model what not to do and how to cut oneself off from others. Like the best comic strips, Enid allows you to both laugh and reflect. And it’s a nice reminder that not only is God colorful, but so is life. Ashley Mae Hoiland, One Hundred Birds Taught Me to Fly: The Art of Seeking God (Provo, UT: Neal A. Maxwell Institute for Religious Scholarship, BYU, 2016), 133. “Gone are the days when a student asked an honest question and a teacher responded, “Don’t worry about it!” Gone are the days when a student raised a sincere concern and a teacher bore his or her testimony as a response intended to avoid the issue. Gone are the days when students were protected from people who attacked the Church” (M. Russell Ballard, “By Study and By Faith,” Ensign, Dec. 2016). Or at least to “stay awake when President Uchtdorf isn’t talking” (Enid vs. Ulterior Motives). This entry was posted in Art, Book Reviews, Culture by Walker Wright. Bookmark the permalink. Oh, man, Enid reminds of my wife as she describes herself at that age.